Doomed Queens by Kris Waldherr is one of those books that everyone, young and old, will enjoy even if they are not history geeks. Waldherr briefly sketches the lives of 50 royal women, from biblical to modern times, who have met bad ends. Some of these women are still very famous such as Marie Antoinette and Anne Boleyn, while others have become footnotes in some history book such as Blanche of Bourbon and Thessalonike, and other still are not royal at all like Evita Peron, but they all have one thing in common: "their femaleness was - and is - considered a liability in their quest for power". Only 2 or 3 pages are dedicated to each woman and yet their stories are throughout told. While it is true that you won't get an in-depth look at their lives, you still get a very concise and complete summery of their stories and of what led them to their deaths, which is the main subject of the book anyway. Despite the macabre topic, the book isn't depressive at all. Waldherr writes about these women in a very amusing, witty and tongue-in-cheek way. I suppose some people may find this humorous way of dealing with the tragic stories and deaths of these women offensive, but the author doesn't mean any disrespect and I really enjoyed her writing style. At the top of every story, there is a small graphic representing the way of death, so if you don't know how someone died and want it to be a surprise, cover that bit with a piece of paper or something. Throughout the book there are also sidebars filled with information about the different ways of death such as poison, starvation and even childbirth, the dynasty the unfortunate female belonged to, legends that surround her and lots more. At the end of every story, there is also a "cautionary moral" that wittily and precisely shows what these tragic queens and their fate can teach us. The book is also beautifully illustrated. Waldherr is not just a writer, she's an illustrator as well and the book is full of contemporary portraits of the queens and her gorgeous drawings, pictures and graphics that enhance the reading experience. I've heard that a lot of these graphics are missing in the ebook version so I highly recommend you get the paperback one for a more enjoyable experience. But this book is not only informative to read and pretty to look at, it is also interactive. At the end of every section, there are quizzes to test what you have learned up until that point. And the book also comes with six paper dolls you can cut out and play with! Doomed Queens is definitely an informative and fun read and a wonderful way to capture the interest of both children and newbies in the lives and deaths of these unfortunate historical figures. 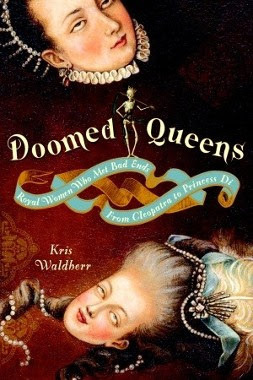 Doomed Queens by Kris Waldherr is a very informative and fun read. The book briefly but throughout sketches the lives of 50 royal women, from biblical to modern times, who have met grisly and tragic ends. Although the topic is sad and macabre, Waldherr's tells the stories in an humorous and witty way that will not depress you (although such a light way of dealing with a topic like this may offend some people). The book is also beautifully illustrated, full of interesting tidbits and contains both quizzes to test your knowledge and paper dolls to play with. Overall, this is a wonderful way to introduce children and adults who may not be into history, into the lives of these unfortunate royal women. Historical Reads: The Birth of "Bloody Mary"